Our DVRs are among the most advanced security DVRs in the industry. However, all DVRs, regardless of make, model or manufacturer will consume bandwidth for remote monitoring of the cameras whether inside the network (LAN) or outside the network (WAN). Currently, the most efficient compression method is the H.264 format. Our DVRs all use H.264 compression and therefore consume less bandwidth than any DVR that does not. Additionally, our DVRs offer the ability to have 2 separate streams of video for every channel. One stream can be used for recording and in most cases, the second stream (usually referred to as the substream) is used for remote access. This feature is great benefit because it allows the DVR to record at the highest quality, resolution and frame rate available thereby preserving the quality of the recorded video while allowing the sub stream to be configured at lower quality to preserve bandwidth for remote access. This feature allows our DVRs to be remotely accessed without having a negative impact on the quality of the recorded video even in low bandwidth environments. Our DVRs can record in various resolutions and frame rates. Currently, the highest DVR recording resolution in the industry is D1 (704 x 480 pixels). The most common resolution is CIF (360 x 240 pixels) which is about 1/4 the resolution of D1. While we recommend the DVR record at D1 resolution at the highest frame rate on each channel, it is not always practical to use these settings for remote access. At this resolution, each camera will consume approximately 250kbps of bandwidth. Therefore, to access 10 cameras at once at the highest resolution remotely, you will need at least 2.5 MBPS of bandwidth. While this is usually not an issue inside the same network as the DVR (LAN) since there is usually at least 100mbps available in the LAN, outside the network is a different story. 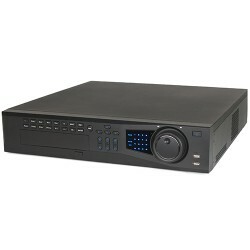 If you consider the DVR as the host and the location where you will remotely view the DVR from as the client, then the host location will need at least 2.5mbps of available UPLINK bandwidth to accommodate all 10 cameras at D1 resolution at the same time and the client location will need at lease 2.5mbps of DOWN bandwidth available. These days, most ISPs will provide at least 2.5mbps of down bandwidth, but most do not offer the same for UP bandwidth. DSL service will usually provide good “Down” Bandwidth, but very limited “Up Bandwidth. Typical service these days is 5mbps+ Down and only around 256kbps – 512kbps “UP” bandwidth. Cable TV providers such as comcast provide high speed connections. Most services these days offer 15mbps+ Down and 3mbps-5mbps “UP” bandwidth. These carriers are a little less reliable, but provide great bandwidth. T-1, T-2, T-3 services are usually offered by the phone company. They are the most reliable service available, but each T-1 only offers 1.5mbps UP and Down bandwidth. A T-2 would offer 3mbps UP and Down, a T-3 would offer 4.5mbps UP and Down. While more reliable, they are usually much more expensive as well.